Shop our selection of CBD Capsules, the easy way to take CBD! Free UK delivery when you spend over £75 at Ampura! 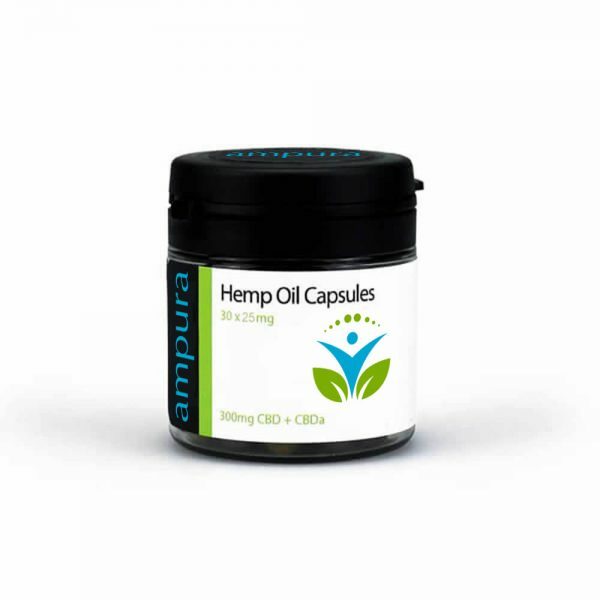 Ampura™ CBD capsules are the easy way to CBD oil without any of the taste and as such have become very popular with our customers. The capsules contain two strengths of CBD oil 10mg and 25mg and these differences are clearly marked on the jars. Expect a slightly slower reaction when you ingest CBD in this way as the oil has to be absorbed during the digestion process rather than under the tongue, sublingually. When they are taken the CBD capsule covering dissolves in the stomach and the oil is absorbed naturally into the system. Also known as CBD tablets although the active ingredients are not in solid form, these capsules are very simple and convenient and provide all the benefits of taking CBD without the taste. Which CBD Capsules should I buy? If you are experienced with taking CBD then you will have an idea of which dosage works for you. If you are new to the product and are unsure, then go for the 10mg strength, slowly building up to the right level, where buying the higher concentration may turn out to be more cost-effective. The CBD pills are vegetarian friendly, easy and convenient to take. The full spectrum hemp extract is infused into coconut oil, so it is very light and easy to absorb. The suggested serving is written on the label to avoid any confusion, simply take 1 CBD capsule, 1 to 2 times a day – 6 to 8 hours apart. Be sure to keep out of reach of children and store in a cool, dry place.